Mars Confectionery produced a classic advertising campaign for the Mars Bar with two Martian television advertisements released in Australia in 2002. The campaign focuses on the idea that just as Earth people eat Mars as an energy source, so people on Mars would eat Earth Bars for energy. The two ads were created by D’Arcy, Melbourne, their last job for Mars Confectionery. The creative team included art director Linda Honan, creative director Mark Collis, copywriter Hilary Badger and agency producer Simone O’Connor. Filming was shot by Joel Pront via Silverscreen, Sydney, with producer Barbara Devlin. Post production was done at Fin Design, Sydney. Editor was Drew Thompson at Guillotine. Sound production was done by Human Worldwide, New York. 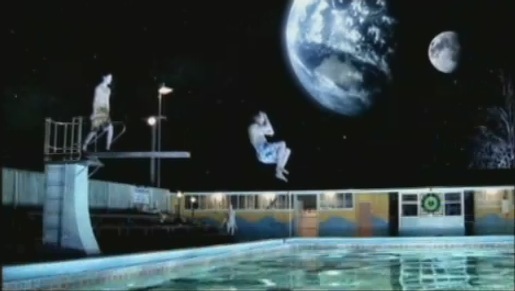 The Swimming Pool ad won a silver for computer imagery and a bronze for special effects at the AWARD awards in 2003.